A portal is an inherent part of the ArcGIS Platform. It’s a destination and a place, but more importantly it’s an organizing structure—a geospatial framework—for GIS resources and workflows. This framework includes the ability to integrate into existing enterprise architectures, leveraging enterprise logins. It define roles and access for members of an organization, reflecting their responsibilities and how they work. It includes monitoring tools and dashboards, revealing the status of what is happening and what is popular. And portals and data management in the cloud all require security (FISMA, SafeHarbor, and FedRamp apply currently). Some portals are implemented on-premises using ArcGIS for Server. Others are implemented in the cloud using ArcGIS Online. And while many portals are public, some are private—only visible within an organization. But regardless of how they are implemented, one thing that is clear is that all of these portals are much more than just a home page—they are the central nervous system for geospatial information in these organizations, and they are transforming the way organizations work. 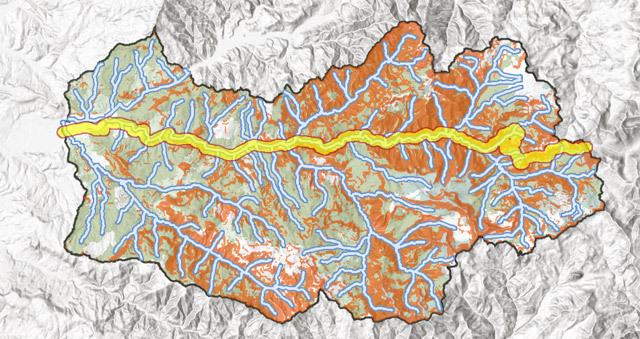 The backbone of Web GIS is online content: authoritative, reliable, ready-to-use maps and data. This content evolves continuously; new data is brought online and existing data is revised and updated. But what’s trending are the new types of services and data such as intelligent layers that can be processed on-the-fly, real-time earth observations, and a wealth of demographic information to enrich your layers. 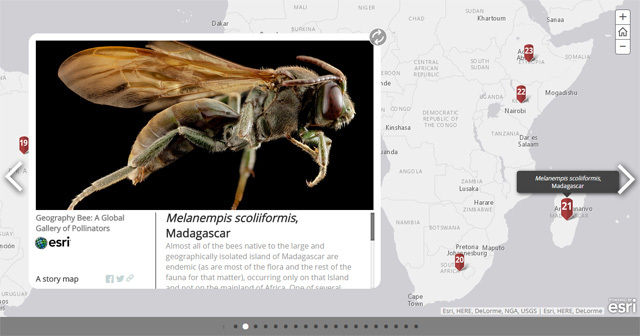 You can browse the many types of online content and see how they are being used by visiting the Living Atlas of the World. Analysis is the heart and soul of Web GIS. These hosted tools are designed to provide answers to the most common geospatial questions. GIS Professionals will find many of these familiar, but they are presented in a way that enables non-GIS users to understand and use these powerful capabilities. And that’s what’s trending—it’s GIS being opened up for everyone via the web. Analysis results shown above were factored into determining the likelihood of finding cougars based on proximity to streams, distance from highways, vegetation favored by cougars, as well as areas of steep slope. The results are displayed on top of a multi-directional hillshade, a new server-side function applied to a terrain (image layer) service. Web GIS is supporting 3D better than ever before, and these capabilities are growing. For example, ArcGIS Pro is a potent addition to ArcGIS Desktop that integrates 2D and 3D visualization, analysis, and publishing. But what’s really trending are 3D web scenes. They enable anyone to view globes, landscapes, cities, and interiors—all in a browser, and with no plug-in required. The scenes captured below are from the Mountains of Fire Story Map. Imagery management in the cloud leverages the best of what the cloud can offer—economical storage, processing horsepower, and ease of access. An example is from E&J Gallo Winery, a major West Coast grower. Like other growers, they are concerned about the effects of drought. 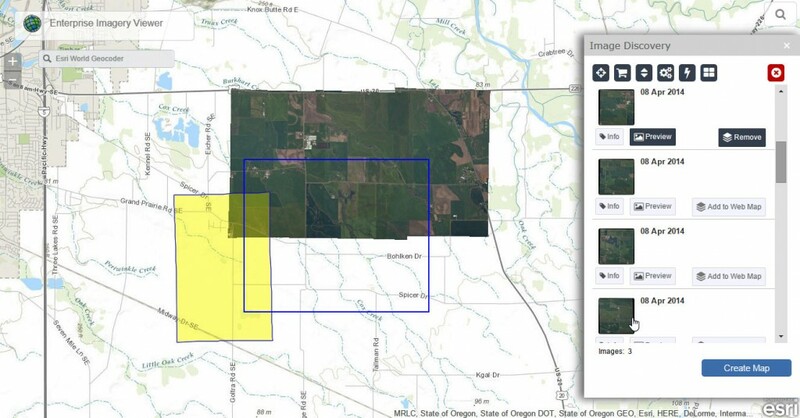 They leverage imagery management in the cloud to store, apply GIS processing, and deliver access to their imagery to conserve water, monitor crop health, comply with environmental regulations, and more. The Enterprise Imagery Viewer delivers the ability to find, select, and preview imagery stored in the cloud, and create web maps for visualization, sharing, and further analysis. E&J Gallo obtains imagery at regular intervals, and it is uploaded to their Amazon S3 cloud storage. Once uploaded, the additions are detected and automated processing is applied to create a virtual mosaic and enable a variety of imagery functions for visualization and further analysis in web maps. What used to take weeks of effort can now be accomplished in a few days. Story maps have become enormously popular. They have made a huge difference in how we reach people and communicate geographically. They combine maps and media—photos, videos and more—into great user experiences that inform, communicate, and inspire. They’re easy for anyone to author, and come in a variety of configurations and layouts. The Story Map Tour and Story Map Journal are just two examples of popular story map templates, but there are many more to choose from. You can view other story maps at the Story Maps Gallery. Many story maps start off as custom applications, and become available as templates that anyone can use later on. One of my favorites is Geography Bee: A Global Gallery of Pollinators, which enhances the compelling photography of USGS naturalist Sam Droegge by placing them into the context of a map. This template will become available later this year. But the most important thing that web GIS has done is make GIS more pervasive. As a result, our tradecraft, skills, and the work we do has never been more valuable. Web GIS has amplified our work. And it also offers new challenges, and new opportunities to think different, and re-imagine what’s possible.